I love the idea of black coffee and a cream cheese-smeared bagel for breakfast so I decided to try making my own, and they worked out a treat. I love the idea of black coffee and a cream cheese-smeared bagel for breakfast so I decided to try making bagels, now that I’ve tracked down the essential malt extract that many recipes require. 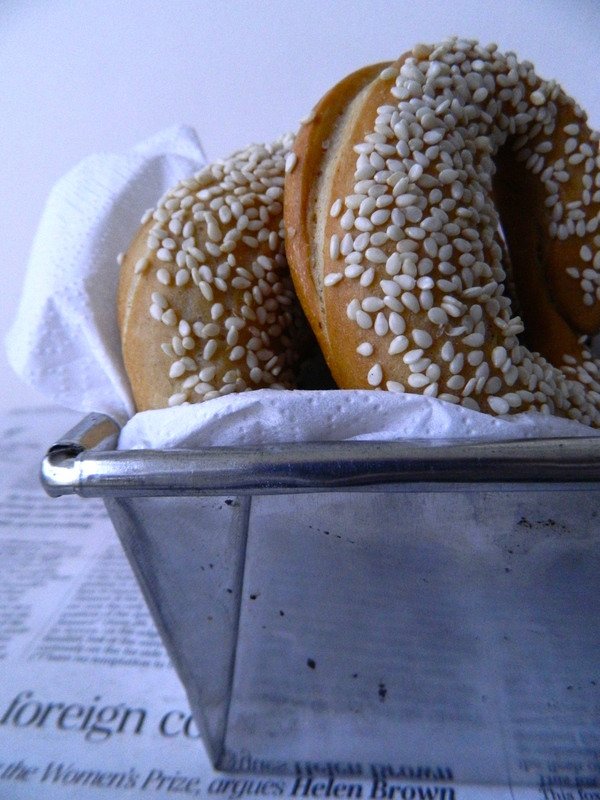 I’ve always loved the idea of bagels; Eastern European, New York, London- Jewish bagels, partly because I’m fascinated by the idea of Jewish cooking, the common patterns and variations that have occurred within a religious culture, across country and regional lines; partly for the way that these foods have, somehow, against the odds, managed to become completely mainstream in many places, particularly in North American cities. As with the pretzels, they’re about as American a food as you can find, in that there is nothing particularly ‘American’ about them. The malt extract is partly what makes ‘bagel-y: it gives them their chewy texture, their deep color and their shiny exterior. It’s a really interesting substance, super sticky, almost toffee-like, but it doesn’t taste as sweet as you’d expect, as it has such a strong, almost savoury, beery flavour all of its own. Because it does have a rather pronounced flavour, start small. Add a little to your dough, a little to your cooking water (like pretzels, bagels are boiled before baking) and an even smaller amount to glaze (I forgot to glaze). In a large bowl sprinkle yeast over hand-warm water and stir until dissolved. Stir in softened butter, sugar, and salt. Mix in the flour, adding extra as required. The dough should be elastic but not sticky. Knead for about 10 minutes. Put the dough into an oiled bowl, cover and leave in a warm place until it has doubled in size (around an hour to an hour-and-a-half). Punch the dough down and divide into small pieces. Roll each piece into a four inch sausage on a floured surface and then press into a circle, firmly squeezing the ends together (I made my dough sausages too long). Allow to prove for another thirty minutes or so, or until doubled in size. Liberally oil two baking sheets and preheat oven to 180 degrees celsius. Bring a large pan of water to boiling point and add the malt extract. When it is at a rolling boil, add the baking soda. Re-seal any opened bagel joins and then drop into the boiling water for a couple of minutes, or until they’re doubled in size and floating. 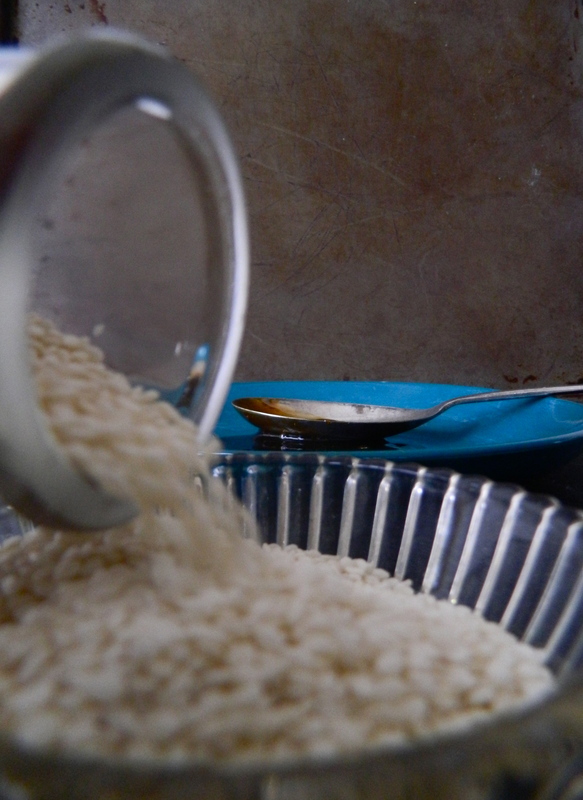 Take them out with a slotted spoon and allow to drain for a few seconds. 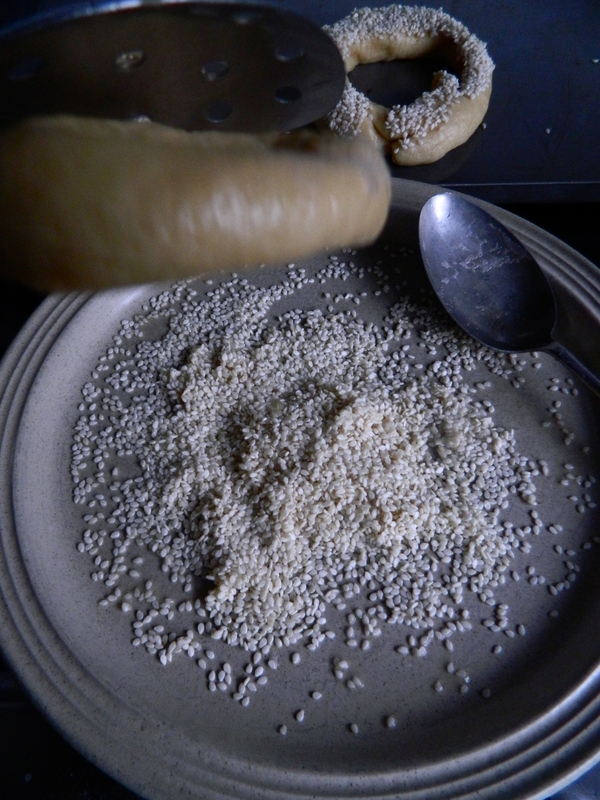 Dunk them in a bowl of sesame seed, shake off excess and place on the oiled baking sheet. Bake for about 15 minutes or until they have a good, deep golden colour. 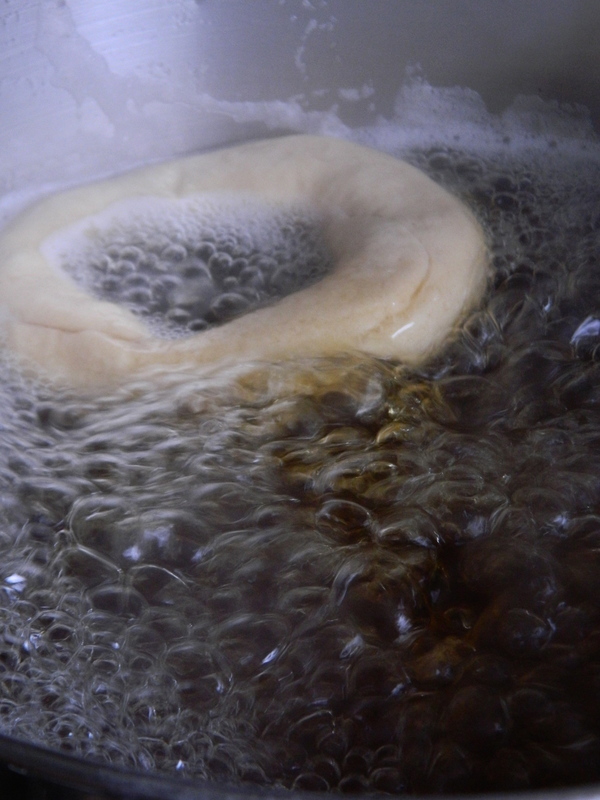 Warm a little malt extract in a small pan and brush on the still-warm bagels, if desired. Note: for the ultimate American-Jewish food read, try Elizabeth Ehrlich’s ‘Miriam’s Kitchen’, which is a very thorough memoir of a family and of a way of cooking. extremally perfect photos! Bagels looks so good 🙂 YUM! Looks fantastic. One of these days I’ll get around to making bagels.